John Hall comes out swinging - "The only "factory" panels left on my WRX are the front doors, and I guess the roof if you want to count that." For those of us that aren't comfortably familiar with Subaru's lineup, such a claim may not be immediately obvious, but that's exactly what John wants. However, for those in-the-know, the subtleties of John's build speak volumes. His sedan-bodied wagon leaves almost no bolt left unturned. A widebody wagon build has been on John's to-do list for several years, with his love affair for Subarus beginning with his first car. "My first car was my Mom's Legacy GT. My tiny high school was at the end of a two mile dirt road where I (without my Mom's knowledge, sorry Mom) had my first experiences with "spirited" driving." From there, things continued, with John purchasing a 2nd-generation 2.5i Impreza Wagon, identical in body style and color to his current car. The swap to his current chassis was geared around one simple reason: the 2.5i didn't have enough engine to justify his desire to cut the car up. An engine swap was feasible, but finding a low-mileage, rust-free, clean example sat better with him. The search yielded a perfect example, but unfortunately for John, as a Vermont resident, the car was located in California. Just before making the purchase, a local car in Massachusetts surfaced, and this time, in John's favor, the car was recently moved from California to the east coast. Without hesitation, John jumped on it. Ownership of the previous 2.5i had allowed John to build upon the vision in his head - coworker and friend Kevin McGovern had his own 2.5RS sedan, previously featured on StanceWorks, which helped John determine his choice and size of wheels, and to establish the suspension setup he'd need when the build came to fruition. 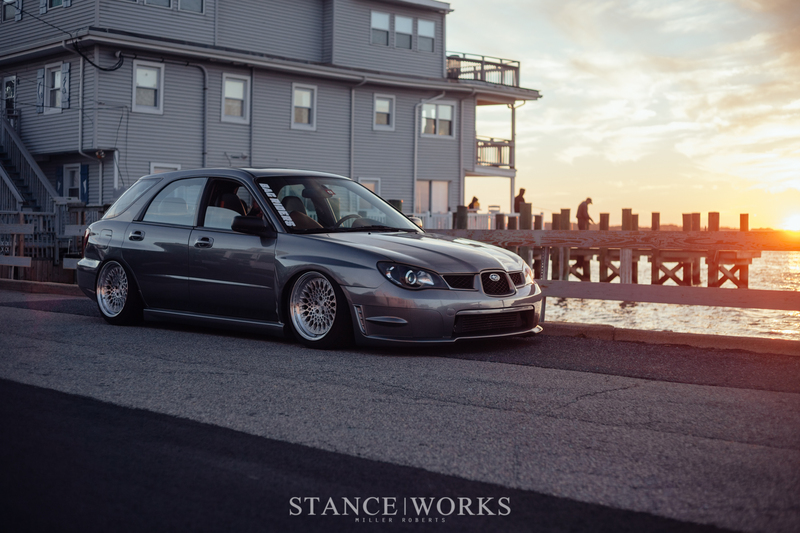 Combined with spotting one other wide-body wagon at H2Oi four years ago, John knew nearly every aspect of what he wanted out of the car, minus the driveline. "The motor work on the other hand was completely a day-to-day thing, I never thought I would have a built motor in this car, but I sure do love it." 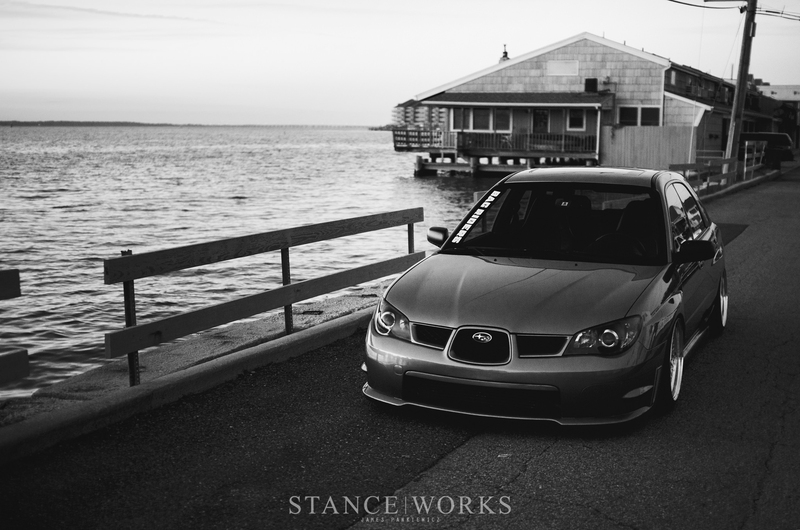 With the WRX wagon in his possession, and a plan in his mind, John got to work on the execution, beginning with the bodywork, along with the help of Cyrus House of House Motorsport and Jack McCaffrey of Many's Autobody. "Well, long story short, it's basically two cars made into one," John tells me. As mentioned, nearly every panel on the car has been modified or swapped out to attain the look, fit, and finish. The nose of the car received sedan boxed front fenders, and the matching front bumper, which was smoothed and shaved.. The WRX hood was ditched in favor of the 2.5i hood, which was scoopless and sleeker in design. The side skirts were swapped from WRX units to 2004 RS parts; "I just prefer them to the WRX ones, I think they're clean and simple." The tail end of the car is where the bolt-on and part-swap work ended. The quarter panels were cut off the car, and the inner wheel wells were extended to fill the void. Afterwards, the sedan quarterpanel was fitted to the wagon. "Lining up the body line with the rest of the car, especially the doors, was the biggest part of the conversion," he says. John then had to swap the rear doors, also sourced from a sedan, to complete the new fender lines. "After the quarters were all done, the rear bumper had to be trimmed a bit to line up with the new body lines." Lastly, the hatch has the emblems and spoiler removed, with all of the holes filled for a clean look. The amount of work in the body changes alone are enough to put John in the deep end of the swimming pool, but the changes themselves are as subtle as can be. To bring life into what could be mistaken for a stock car, John moved on to the suspension and wheels. It should go without saying that Bag Riders was the answer to the problem at hand, and as Bag Riders' IT director, John was driven to push the car's suspension to perfection. 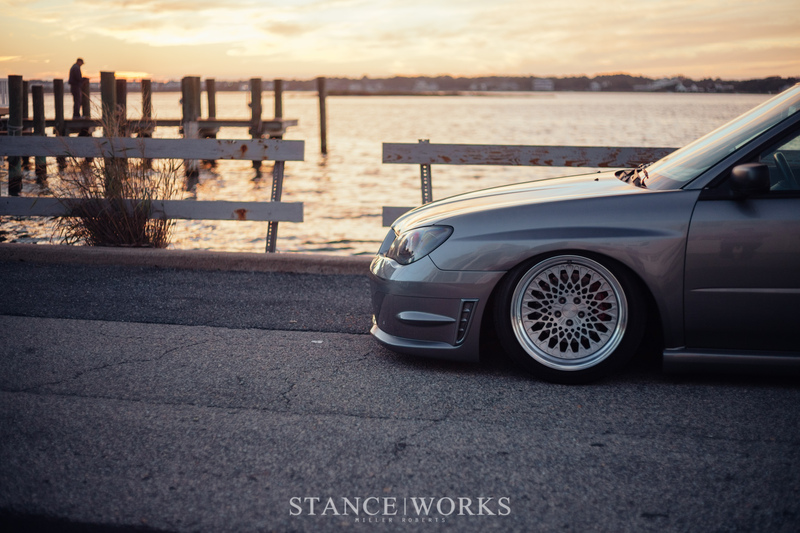 Air Lift Performance front and rear struts, which the Bag Riders team helped to develop and bring to market, brought John's car down to the ground. Digital management keeps things working in unison, with Zaetech digital pressure gauges allowing John to keep his own eye on things. John didn't stop with the struts; H&R Camber Bolts, A Whiteline 22mm swaybar, and Kartboy front and rear endlinks help to round out the setup. 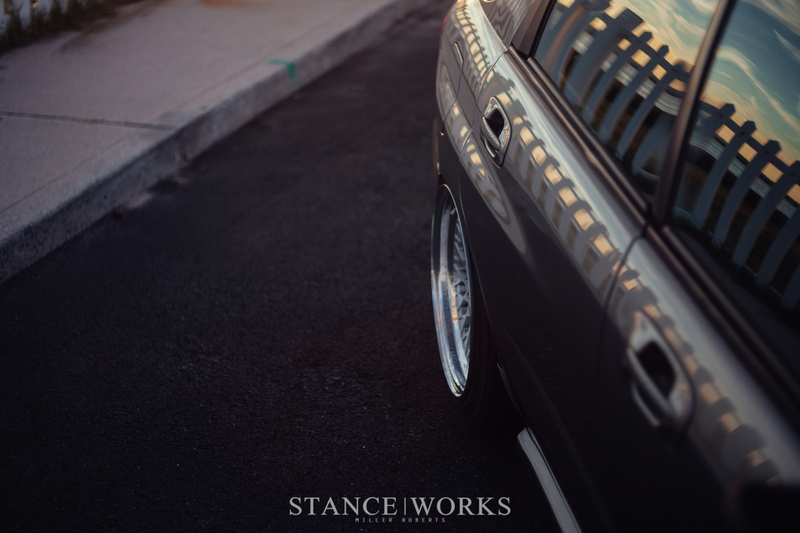 Lastly, John sought out his wheels, and finally decided on a set of Rotiform 3-pice LHRs, measuring out to 17x10 on each corner. Concave faces, hidden hardware, and stepped lips create a perfect combination, and things are wrapped up in Dunlop Direzza 225/45s. John also tended to the interior of the car. Starting from the top down, John opted for a black alcantara headliner, sun visors, and pillars. All of the interior trimmings were dyed black, and amenities were updated, such as the interior lighting which was converted to LEDs, and the instrument and cluster lighting was converted to red. 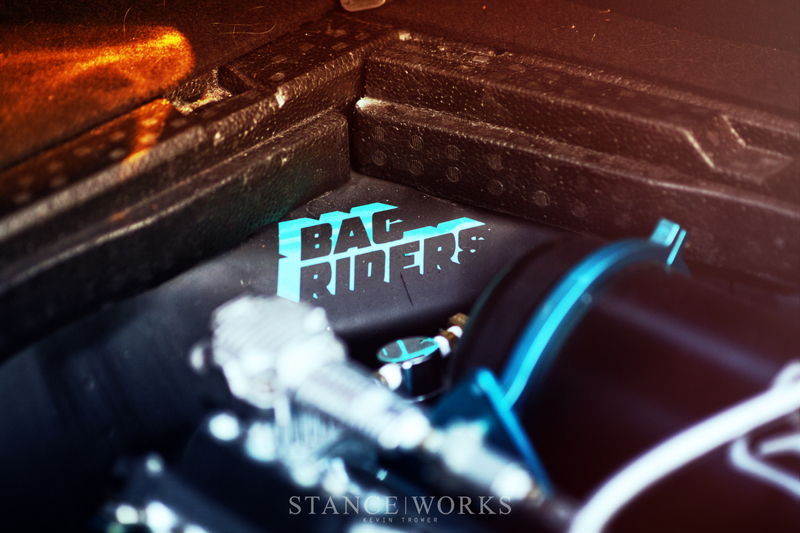 Gauges, an extensive short shift and shifter assembly, and even a stereo install allude to John's thoroughness. Under the hood is where John least expected to make changes. While he sold his 2.5i for the WRX solely because of the lack of power, he expected the turbocharged boxer to be enough. However, he now sports a mod list too long to repeat. John laughs it off, "The 'too long, didn't read' version is a built short block, stock heads, reversed intake manifold, ported intake tract, lots of mods." The outcome is stout, with nearly 370 horsepower and pound-feet of torque at the wheels. 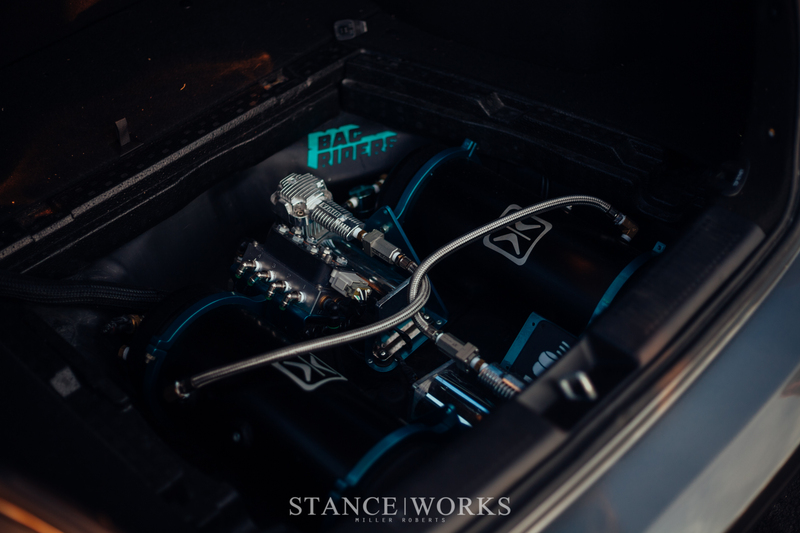 The engine was built by Charlie at Six Star Motors and Tuned by Bren at BrenTuning, both of which John touts as flawless work. The to-do list is never done; John says that, against his better judgement, he'd perhaps like to shave the engine bay. 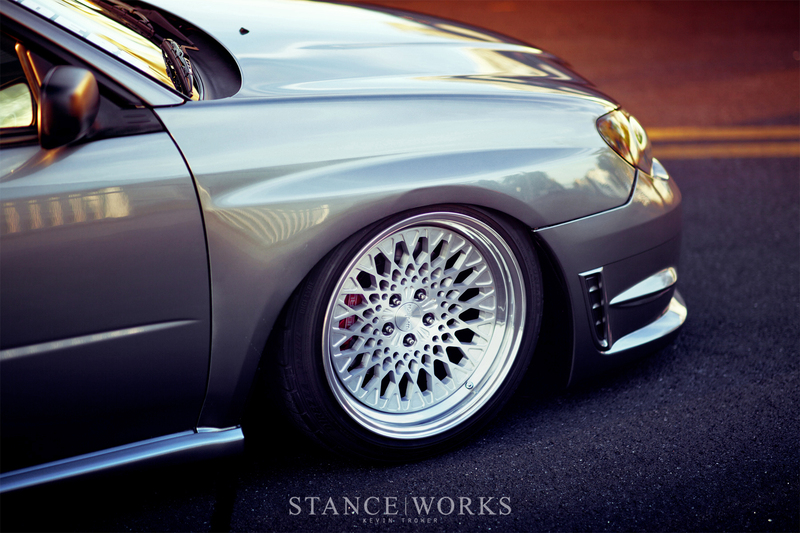 Bigger brakes, new wheels, and fixed-back seats have also been calling his name. ".... but I'm also house shopping so I'm trying to hold off on car mods until I get that figured out." Hang in there, John! If there is any place for special thanks, I'd like to give thanks to: Everyone at Bag Riders, Corey at Air Lift, Jason and Brian at Rotiform, Reno at AccuAir, Alex and Bren at BrenTuning, Cyrus at House Motorsport, Charlie at Six Star Motors, Jack at Many's Autobody and my girlfriend Ashley. i would like to see photos of the rear end and the interior. apparently, all the focus is on the wheels. The article isn’t focusing on the wheels, it is focusing on the wide body flares from the STi, which so happen to be complimented by the wheels (which are, in my opinion, a pretty amazing). But I would also like to see interior pictures… Although I doubt Mike will add any. WOW I’m so jelly right now! Best wagon hands down so clean and subtle which makes it look OEM. This will make even the biggest wagon haters bow down. I have not been on all the auto blogs in a good while, and this morning I have been jumping around them hoping to see am Impreza wagon to get me excited to buy junk for mine. You guys have made my morning with this post, as this makes me excited to buy junk for mine hands down. for all the wagon haters out there, check this out!!! 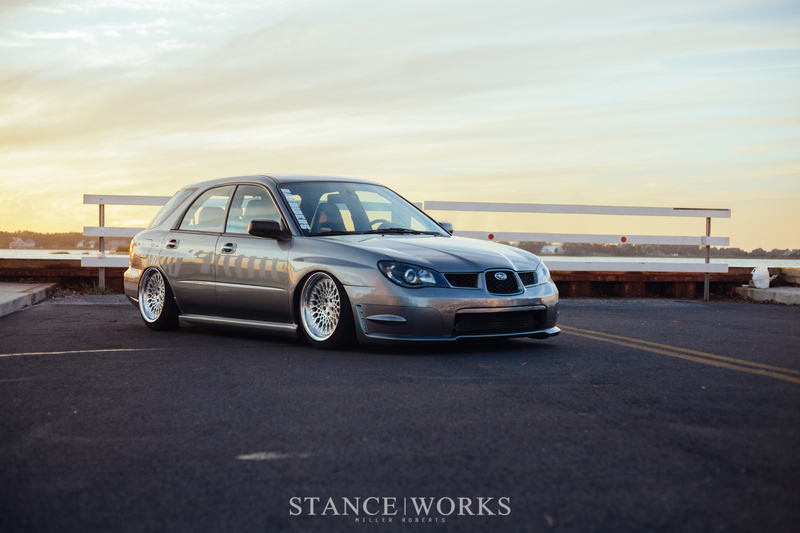 i personally love wagons and will defiantly own one some day.